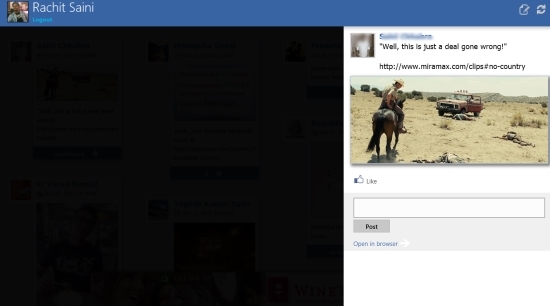 Feedlets for Facebook is a Windows 8 Facebook Feed app. It can be used to get latest Facebook feeds. Remain updated with what is happening with your Facebook. In addition to that, you can also like and can comment on the posts. Feedlets for Facebook also gives you with the ability to update your status from the app itself. The Facebook interface which this app provides to you is very attractive. Feedlets for Facebook is freely available in the Social category of the Windows Store. As you land into the app, the option to connect would be shown. As you use this option, the app will ask for your Facebook credentials. As you use this option, the app will show you all the latest from your Account. What I found really catchy about the app is the way the feeds appear. The feeds will appear as tiles. Along with that, Feedlets for Facebook also gives you the ability to like, and comment on posts. For that, you can click on the tile of any feed that is appearing here. As you click on any of the feeds appearing here, it will open in front of you, in a vertical panel on the right side of the app. You can like the post or can comment from here. Along with that, you have the option to view that comment or like in the browser. For that use the option for it at the end of this panel, and the app will open up the Windows 8 IE app that is available in your system by default. Along with that, this Facebook Feed app will let you to update your status from the app itself. For that, you can use the option for it given on the top bar on the right side. A page like icon with a pen is available there. Click on it, and the app will open up a text box where you can provide your update message. You can log out anytime using the option for it given at the top left corner. This Windows 8 Facebook Feed App is freely available in the Windows store. Its interface is quite nice. It provides a better view of updates from your Facebook network. Get updates from your Facebook account. You can comment on posts. There is also an option to update your status from the app itself. 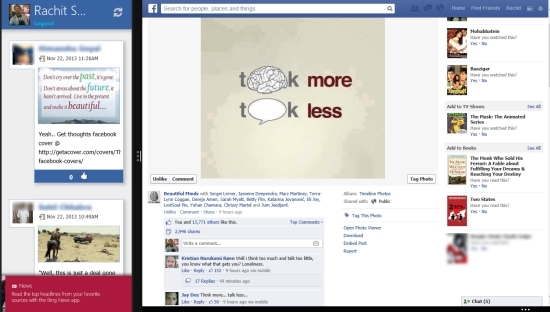 To end it, I would like to conclude that Feedlets for Facebook is a good Windows 8 Facebook Feed App. In addition to the capability to see updtes, you also get the capability to update your status, or comment on any update , which is quite good feature. It deserves a try for sure. Also look out for our recommended apps, we have mentioned about.